Free promotional giveaways are given to take the brand image to more people. The custom single function pedometer serves this purpose very well. It is an affordable promotional item suitable for those in to health care or pharmaceutical industries. 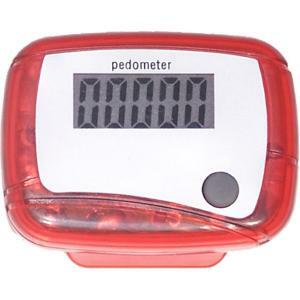 The promotional single function pedometer takes your products to the common man. It is an easy device that could be used by anyone. The step counts up to 99,999 will be displayed on an easy to read large display screen of the red personalized single function pedometer. Imprint Area : 27/32" x 5/16"
Product Size : 1 29/32" x 1 13/32"